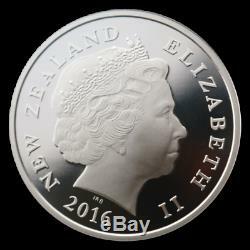 New Zealand - 2016 - Annual Proof Coin Set - Queen Elizabeth II - 90th Birthday. 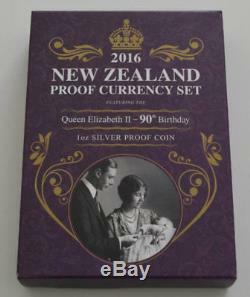 2016 New Zealand Annual Proof Coin Set - Queen Elizabeth II - 90th Birthday. The 2016 New Zealand Proof Currency Set features special proof versions of New Zealand's iconic currency coins alongside the 1oz silver proof. Queen Elizabeth II - 90th Birthday Coin. 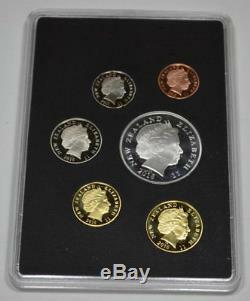 Stunning proof versions of New Zealand's decimal currency coins. 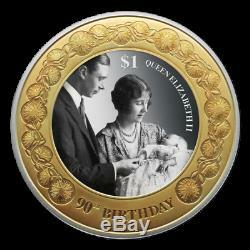 Includes the Queen Elizabeth II - 90th Birthday silver proof coin. Worldwide mintage of 1,000 sets. Each of the coins is uniquely dated 2016. The Queen Elizabeth II - 90th Birthday Coin features the Duke and Duchess of York (later King George VI and Queen Elizabeth, the Queen Mother) pictured holding their daughter, Princess Elizabeth (later Queen Elizabeth II) as she sleeps in a precious christening gown. The photo has been printed using a minted photo image technique, replicating the photographic look from days gone by. The photograph is framed by beautiful, high-relief gold plating featuring New Zealand's pohutukawa flowers. 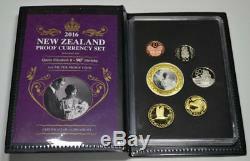 The set also features proof versions of New Zealand's circulating currency coins. Each coin is specially dated 2016, making this set a unique collectable to mark the Queen's 90th Birthday. The coins represent Aotearoa New Zealand's unique culture, history and identity, and with just 1,000 sets available they won't last long. The 10-cent coin is the lowest-denomination coin in New Zealand currency, and replaced the New Zealand shilling coin in 1967. As part of changes to New Zealand currency in 2006, the circulating coin became smaller and is now made of copper-plated steel. The reverse features a koruru (carved mask) with heke (rafter) patterns. When introduced in 1967 the 20-cent piece replaced the New Zealand florin coin. Initially the coin featured a kiwi, but this was changed in 1990 to a carving of Pukaki, a well known chief of the Ngati Whakaue tribe. When the silver decimal currency was changed in 2006, the 20-cent piece was redesigned with a'Spanish flower' milling. The largest denomination of the original decimal coins, the 50-cent piece replaced the crown coin (five shillings) in 1967. The New Zealand one-dollar coin was introduced in 1991 to replace the one- dollar note. The reverse features New Zealand's iconic kiwi surrounded by silver ferns. The kiwi was promoted from its position on the 20-cent coin to bring to life the well known term'Kiwi dollar'. The two-dollar coin was introduced in 1991 when the two-dollar note was retired. The reverse features a kotuku (eastern great egret, or white heron), which is held in high regard in Maori culture. Kotuku are considered to embody rarity, grace and beauty and are considered inhabitants of the spirit world. Portrait of Her Majesty Queen Elizabeth II by Ian Rank-Broadley, United Kingdom. Queen Elizabeth II as a baby with her parents the Duke and Duchess of York (later King George VI and Queen Elizabeth). 2,500 (1,500 individually and 1,000 as part of the 2016 New Zealand Proof Currency Set). Milled with a channel with ten raised beads. Eight alternate segments, four milled and four plain. New Zealand's national bird, the kiwi. The HMS Endeavour with Mount Taranaki (Egmont) in the distance. A carving of an 18th century M ori leader called'Pukaki. A M ori carved mask or'koruru' with M ori rafter patterns. We are coin dealers based in Auckland, New Zealand. Coins, Banknotes, Bullion & Collectibles. We offer coins for sale through our online store, including the largest online selection of New Zealand Coins & New Zealand Coin Sets. 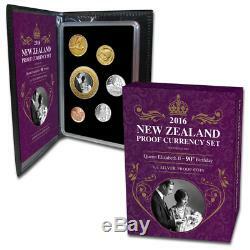 The item "New Zealand 2016 Annual Proof Coin Set Queen Elizabeth II 90th Birthday" is in sale since Saturday, February 24, 2018. 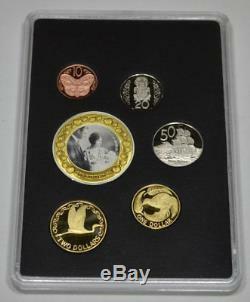 This item is in the category "Coins\Coins\Pacific\New Zealand".nz" and is located in Auckland. This item can be shipped worldwide.